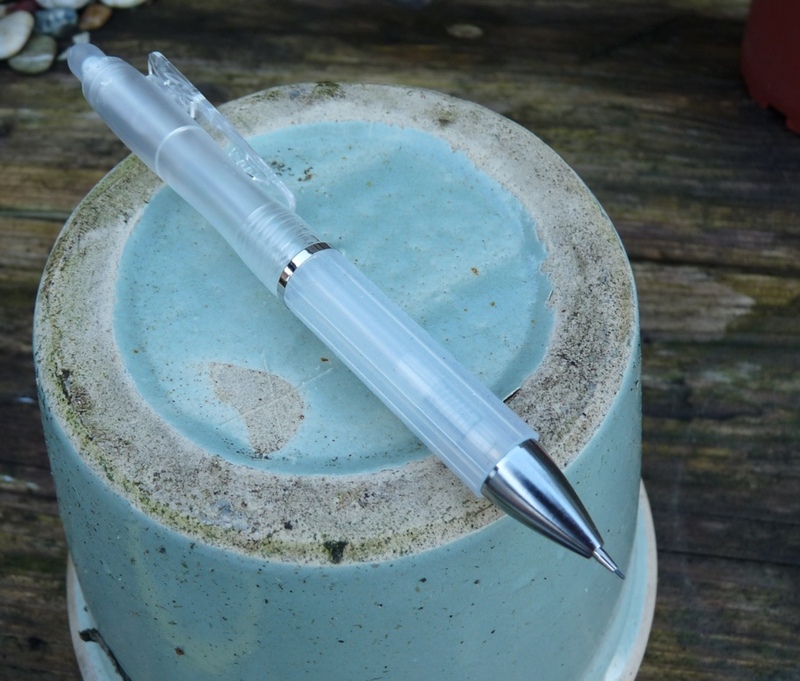 Muji Acrylic Mechanical Pencil Review – Pens! Paper! Pencils! 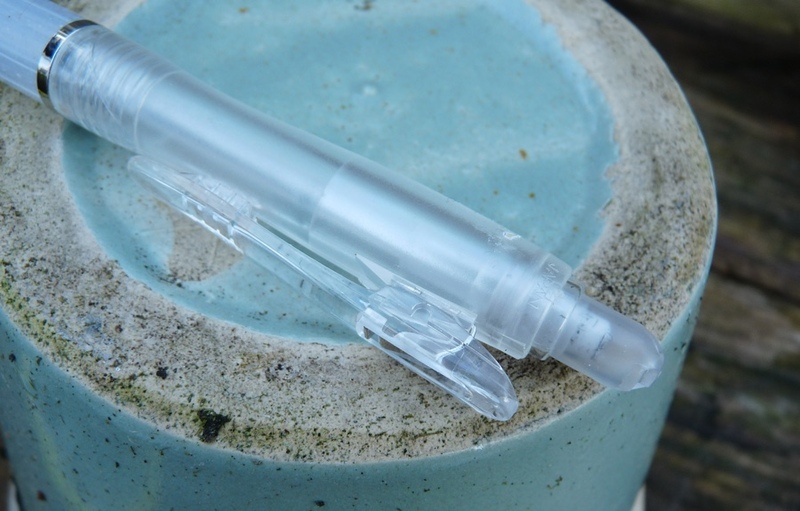 The Muji Acrylic Pencil is a 0.5mm mechanical pencil that costs £2.50 in the UK and $3.50 in the US. It has a most excellent sprung clothes-peg style clip. It will clip onto most things and it’s very unlikely to break. It’s great! 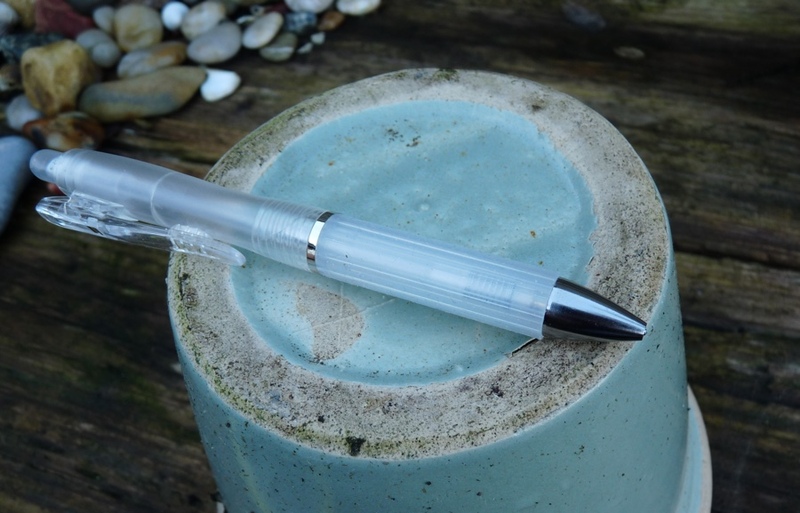 The barrel is, unsurprisingly, made of clear acrylic and if you like that kind of demonstrator style it looks pretty good. I do, so I’m jolly happy. The grip is rubberised and comfortable. 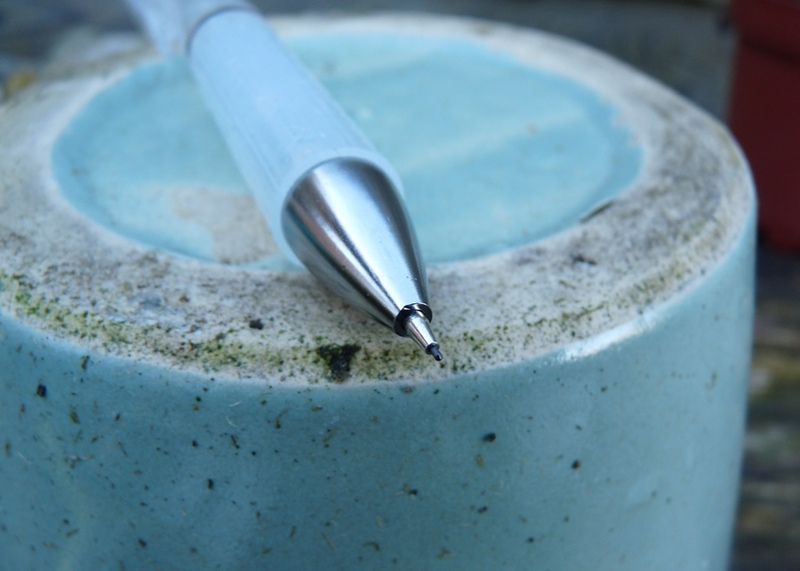 The tip is retractable and holds the lead firmly. The tube holds several leads and, being transparent, it’s easy to see how many you’ve got left. The eraser works well but is a little small, as is so commonly the case. I’ve reviewed pencils that cost ten times as much that had a worse clip, a much worse eraser and weren’t as comfortable to hold. The Muji Acrylic Pencil does everything it should well. This is the best budget mechanical pencil I’ve found to date. 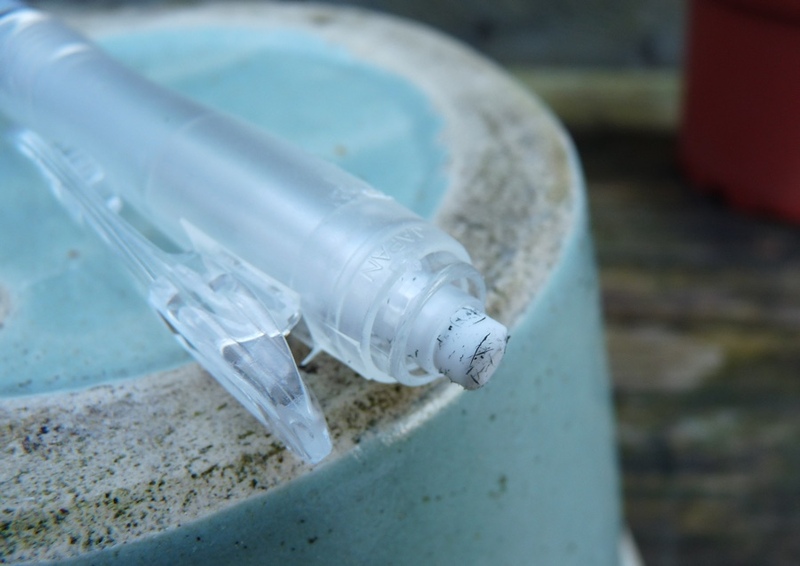 I bought a Muji brushpen last year that was surprisingly good as well – a shame the nearest store is in the Trafford Centre. One thing I do find is that the apparent default for mechanical pencils (0.5mm) is a bit thin for me; I much prefer a 0.7 or 0.9mm personally. 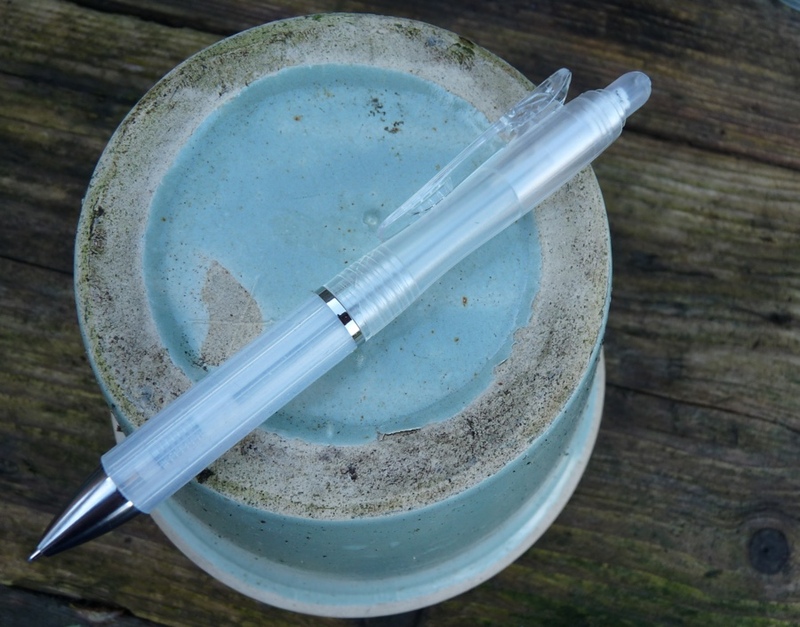 So far the only Muji product I haven’t liked has been the fountain pen. I like their style. And I know what you mean about defaults. 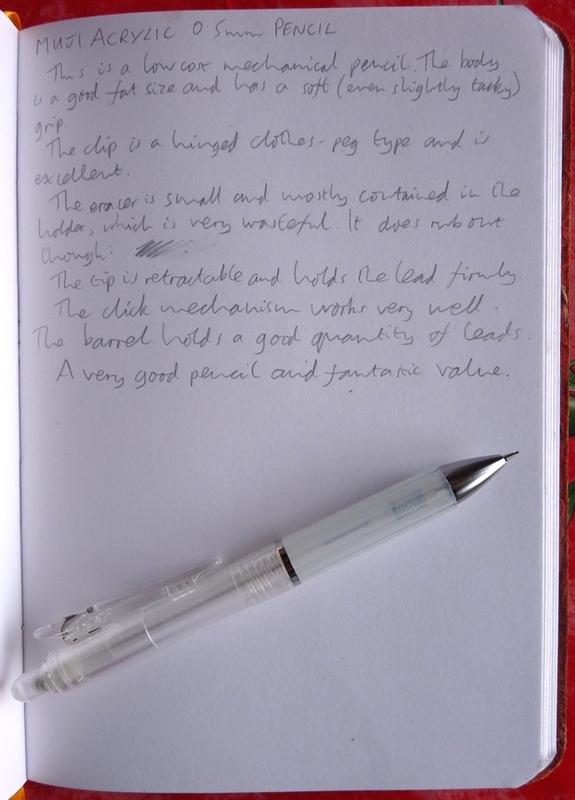 I don’t find too much if a pencil is 0.5 or 0.7 but with fountain pens I like broad or fine but not so much medium, which is often the only option. is that a crack I see on the plastic threads??? No it’s hard to see in the photos but that’s part of the design.